Computers which are idle or not in use but are "Switched ON" are wasting energy which an organization has to pay for. That not fair ... According to stats, in United States alone , more than 3.2 billion dollars worth of energy is wasted annually by not shutting down or reducing the power state of computers when not in use. How to save this money ? Few countries and many US states have implemented energy savings rebate programs to encourage corporations to adopt Greener IT practices. Some of the Greener IT practices include shutting down computers when not in use , using power profiles to track and optimize energy utilization , keeping computers powered off on weekends (if idle).One of the best ways to save energy from computers in an organization, is to provide employees with laptops which they can carry it home.However this leads to possibilities of confidential data being leaked or stolen. Shavlik Technologies is a global leader in simplifying IT management.NetChk Protect Plus Power Management Solution - by Shavlik provides a comprehensive platform for managing power usage of endpoints like desktops,laptops and servers. Shavlik also integrates the Wake-On-Lan functionality to wake-up sleeping computers on demand.This technology helps an organization maximize energy savings and make some GREEN $$$ (save money from reducing operations cost). 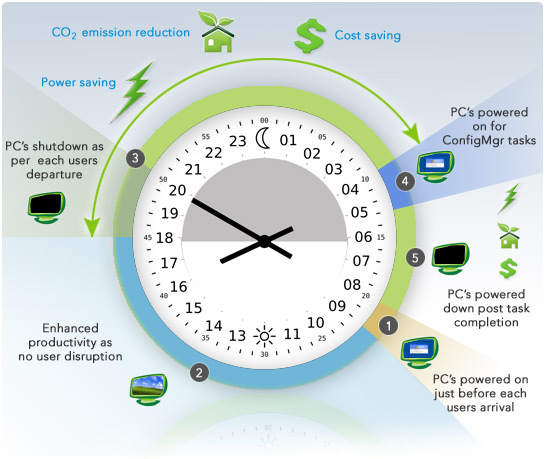 "PC Power Management LifeCycle" shown below gives a great insight into how energy savings can be done from PCs. Due to Wake-On-LAN technology (WOL) , machines can be powered off when not in use, then activated for a maintenance window using WOL (sending a magic packet to wake-up the computer over the LAN). Typically out of 24 hours , computers are used only for 9 hours for some productive work.If the computer is ON ( or even if the computer is in locked or screen saver mode ) for the remaining 16 hours, its a waste of energy ,money and increases the CO2 emission impacting the environment. With Power Profiles and WOL , end-user impact is minimized by powering machines off at night and on weekends and then powering them on at start of the working day. What is done for PCs that have "insomnia"? Does Shavlik include PC health checks to maximize the ability to shutdown and restart successfully? If a PC is not healthy, it simply won't shutdown. Also, wondering if Shavlik uses the industry calculation for PC power savings or it actually goes down to the make and model of the PC to get accurate savings reports? For PC insomnia , nothing much has been done by Shavlik as an out of the box offering.However "IBM Tivoli Endpoint Manager" formely BigFix, does provide an out of the box fixlet/policy to detect computers suffering from "pc insomnia" and take an action to force them to sleep/hibernate or transition to a lower power state. Nothing much on checking the "agent health" but yes it does provide some basic graphical interface for viewing computers which have threats detected , which need patches , which service packs etc. Agent Health includes a lot more than this like "CPU utilization < threshold" , "Number of times the machine was restarted" , "Number of program crashes" , "Uptime statistics for power management" etc. Monitoring the agent health is very critical for self-healing of the agent. Not sure on how Shavlik calculates the power saving from its "power calculator" ??? Need to investigate more on this.